In the Himalayan regions, there exist many kinds of popular Buddhist dance forms, usually performed during festivals or harvests. Some of these, like the one at the Hemis Monastery in Ladakh or the ‘Lama Dances’ of Sikkim are known the world over. Specifically, they are forms of tantric dances, performative manifestations of the highly ritualised Vajrayana Buddhism. Many lesser known forms of Tantric Buddhist dances exist, none more so than those recorded by the Newar Buddhists of the Kathmandu valley. Their’s is an unique culture: the Newars are the sole remaining Buddhists who follow the Sanskritic Indic Mahayana tradition of Bihar, Bengal and Kashmir, complete with an artistically complex system of Vajrayanic modes of worship whereby tantric Vajracharya priests officiate over community rituals as well as devotional and life-cycle ceremonies. As is evident with Tibetan Buddhism, the Vajrayana lays great emphasis on the creativeness of religious ritual, incorporating vividly visual sadhanas or meditational techniques, as well as the use of theatrical gestures and the ritual art creation of mandalas and thangkas (‘paubha’ in Newari; ‘pata’ in Sanskrit). This mastery of religious art ties in perfectly with the Newars’ continued excellence in the plastic, decorative and performative arts, with master craftsmen producing stunning works of sculpture and painting for at least a thousand years now. Professional artists, many of whom also double up as religious specialists, have, as a rule, assiduously maintained a corpus of sketchbooks, filled with line-drawings of models, annotated instructions, as well as their religious and spiritual interpretations. Many of the historical ones have been collected and published, and recently I came across some stunning sketches of tantric Buddhist dances from the 18th century, in the scholar Gudrun Bühnemann’s book Buddhist Iconography and Ritual in Paintings and Line Drawings from Nepal. 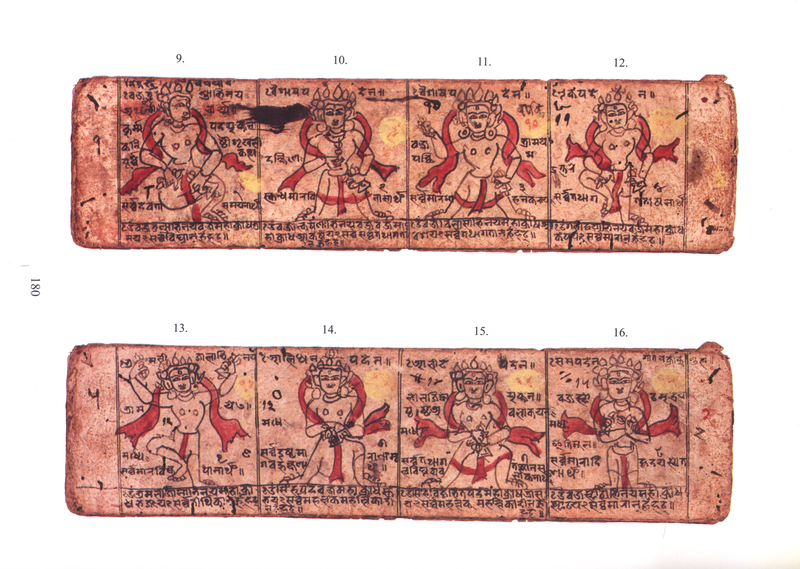 These sketches were made on palm-leaf manuscripts, and they portray the Parikramavidhi, the ritual dance around a site to purify it before the construction of a mandala. Highly influential in Nepal, the Parikramavidhi was a detailed ritual manual written by a Newari Vajrayana monk named Kuladatta sometime in the 13th century, as a part of his book, the Kriyasamgraha-panjika, in which he outlines the rituals required to consencrate a vihara (monastery). The manual was in turn based on a older texts like the famous Mayajalatantra and the renowned Bengali tantric monk Abhayakaragupta’s ritual compendium, Vajravali, written in the early 12th century CE. Making full use of forms from the Indian classical dance tradition of the Natyashastras, the sketchbook visually shows the various mudras (gestures), abhinayas (stances) which are to be performed with prescribed mantras, by the officiating monks/priests. Dressed in full ritual regalia, they are to assume the roles of various tantric deities, Bodhisattvas and directional guardians in order to purify the space. 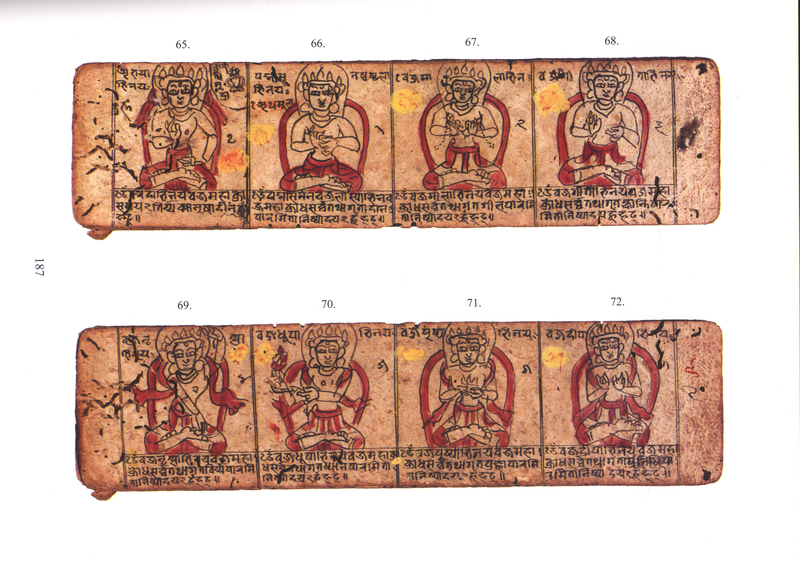 Works of art like this manuscript, helps us get a deeper sense of the vibrant cultural and artistic lives of a people. So the next time you visit Patan, and see the wonderful Newari viharas like the Hiranyavarna Mahavihara (popularly known as the Golden Temple), know that prior to the building of that monastery or the various three-dimentional mandalas in its courtyard, many hundred years ago, Buddhist tantric adepts had probably performed a beautiful dance like this, to consecrate the site. The performance must have been as arresting a sight as the Cham dance of Hemis. Here are some panels from this beautiful manuscript. 9. Vajraghantabhinaya in the Kurmapada stance facing east (of the mandala), evoking the Buddha Vajrasattva. 10. Vajrotkarsanabhinaya in the Vaisakhapada stance facing south, evoking the Buddha Akshobhya. 11. Vajravilasabhinaya in the Vaisakhapada stance facing west, evoking the deity Vajrakarman. 12. Garvadvayabhinaya in the Ekapada stance facing north, evoking the deity Krodhalasya. 13. Bhramarijalabhinaya in the Ekapada stance facing the centre, evoking the Buddha Vairochana. 14. Simhapadabhinaya in the Alidhapada stance facing the centre, evoking the deity Yamantaka. 15. Simhavijrambhitapadabhinaya in the Alidhapada stance facing the centre, evoking the deity Takkiraja. 16. Vajrasphotabhinaya in the Samapada stance facing the centre, evoking the deity Vajrasphota. Each of these stances are adapted from the Natyashastra, where they are specified as standing postures for male performers. Here’s another panel showing one abhinaya performed by an assisting adept, and seven abhinayas that evoke seven goddesses of ritual puja offerings, performed by the Mulacharya, while sitting in the yogic lotus posture, or padmasana. 65. Abhayabhinaya performed by the officiating adept in the north of the mandala. 66. Vajralasyabhinaya, evoking the goddess of beauty, Vajralasya. 67. Vajramalabhinaya, evoking the goddess of the garland, Vajramala. 68. Vajragitabhinaya, evoking the goddess of song, Vajragita. 69. Vajranrityabhinaya, evoking the goddess of dance, Vajranritya. 70. Vajradhupabhinaya, evoking the goddess of incense, Vajradhupa. 71. Vajrapuspabhinaya, evoking the goddess of flowers, Vajrapuspa. 72. Vajradipabhinaya, evoking the goddess of the lamp, Vajradipa. Many such examples of the beautiful artistic traditions of the Newars exist. It’s a pity these aren’t better known. Finally, these dance forms remain a vital part of Newar cultural life, as can be seen in this recent video of the dancer Raj Sakya performing the tantric text Manjusri-Nama-Samgiti in a Buddhist courtyard in Patan.